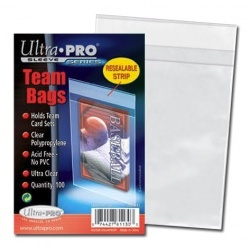 CASE QUANTITY - Resealable bags hold 20 to 30 trading cards. Use these to store manga comics and small digest-size magazines such as Reader's Digest, TV Guide, etc. CASE QUANTITY - Store manga comics and small digest-size magazines such as Reader's Digest, TV Guide, etc. 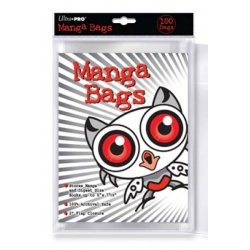 Holds manga comics and small digest-size magazines such as Reader's Digest, TV Guide, etc. This is a CASE containing 100 packs of 100 bags (10,000 bags). If you are looking for less than this amount, see this item instead. Use these to store manga comics and small magazines such as Reader's Digest, TV Guide, etc. This is a CASE containing 10 packs of 100 bags (1000 bags). If you are looking for less than this amount, see this item instead. 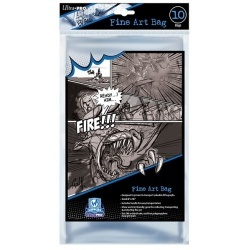 The 8" x 10" Fine Art Bag is part of the exclusive line of high-end comic book and artwork supplies in partnership with Wizard World. Specially designed for conventions, the Wizard World line is the perfect solution for collectors and dealers alike. 8" x 10" Fine Art Bag features custom designed, easy open top that allows easy access for fine art and lithographs. Die cut handles for easy transport at conventions and shows. Made from Archival quality polypropylene film. 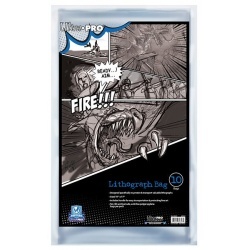 Sized to fit artwork up to 8" x 10"
The 11" x 17" Lithograph Bag is part of the exclusive line of high-end comic book and artwork supplies in partnership with Wizard World. Specially designed for conventions, the Wizard World line is the perfect solution for collectors and dealers alike. 11" x 17" Lithograph Bag features custom designed, easy open top that allows easy access for lithographs. Die cut handles for easy transport at conventions and shows. Made from Archival quality polypropylene film. Sized to fit artwork up to 11" x 17"